Fire, sunlight, water, crystals, moonlight and stars, these were the first experiences mankind had with observing and studying light and optics. It is estimated that as early as 1.4 millon years ago fire was used as a tool by the ancestors of modern humans, by 500,000 yrs ago it was being used to light the way at night by way of torches and bonfires and by 15,000 yrs ago, animal fats and oils were being used to fuel lamps, thought to be the first artificial devices for creating light sources. 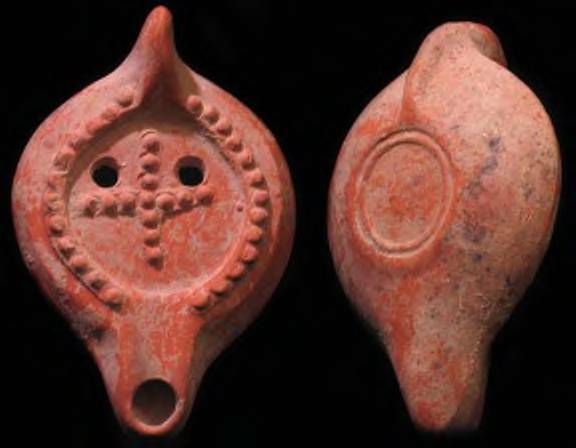 In the 19th century, Archeologist Austin Laynard made archeological findings that suggested that African, Asian and Middle Eastern Cultures were aware of optical phenomena and were using them for other purposes by the year 3000 BC. Greek scholars had begun to study and theorize optical phenomena by the year 300 BC. They studied light, vision, color and astronomical phenomena. It was the beginning of scientific optics. 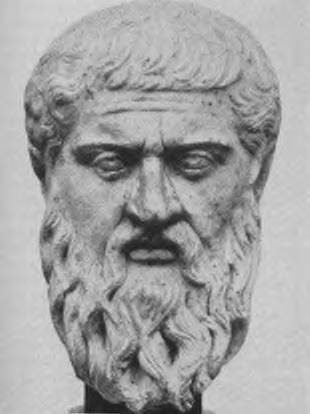 It is believed that Plato was the first person to discuss the emmission theory of vision. This theory suggested that the eyes projected rays of light, similar to the beam of a flashlight, illuminating objects in front of them. when someone or something blocked the eye rays, the result was darkness. This theory prevailed until the 2nd Millennium AD. Euclid of Alexandria made the first recorded observations concerning optics and light in his written work Optica. There he defines the laws of reflection of light on smooth surfaces. Archimedes, a Sicilian mathematician, studied reflection and refraction, but his works were destroyed when Syracuse fell to the Romans. Seneca, a tutor and favored friend of Roman Emperor Nero, noted the magnifying effects of liquids in transparent vessels. Nero is reported to have used a smooth emerald lens to better observe gladiators in combat. 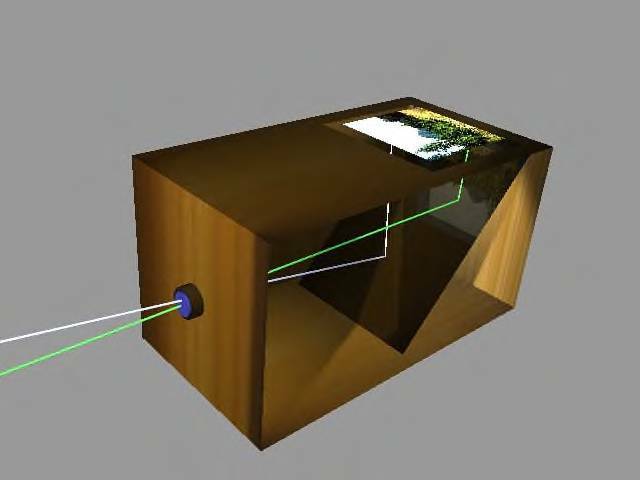 The idea for the camera obscura, the ancestor of the camera, most likely originated in early Greece. The camera obscura was a pinhole camera in which light passed through a small hole and was projected in a darkened room or box, generally without the aid of a lens. Scientists used the camera obscura to view solar eclipses without damaging their eyes, and it is still utilized for that purpose in modern times by amateur scientists and the general public. 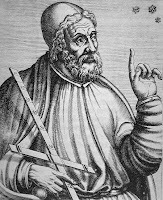 During the second century AD, Ptolemy, a Greek astronomer based in Alexandria, Egypt, studied and wrote the geocentric, or Earth-centered, theory of the solar system that would prevail for over a thousand years. He published five books about optics, but only one book has survived to the modern era. This series of works was dedicated to the study of color, reflection, refraction, and mirrors of various shapes. Arabian scholar Alhazan, a.k.a. Abu Ali Hasan Ibn al-Haitham, conducted the first serious study of lenses in Basra (Iraq). He studied refraction in lenses, disproving Ptolemy's law of refraction, and also carried out research on reflections from spherical and parabolic mirrors. His writings were the first to explain vision correctly, as a phenomenon of light coming into the eye, rather than the eye emitting light rays. 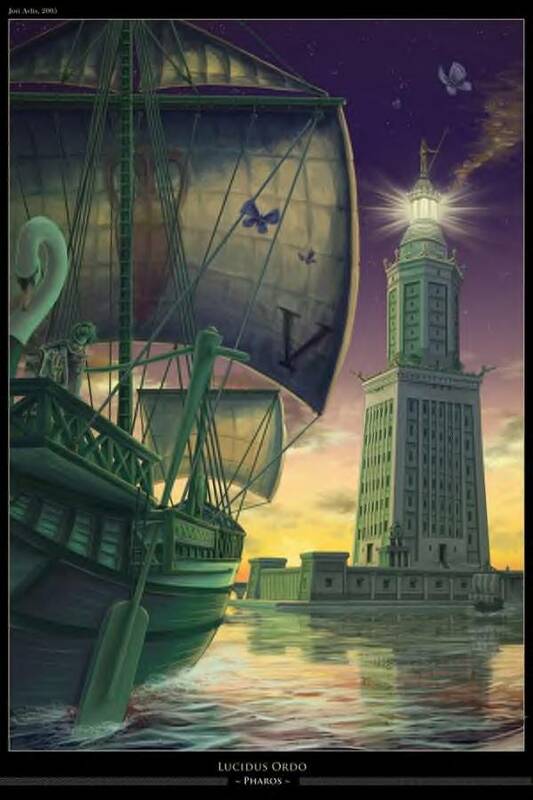 Around 280 BC The Egyptians completed construction of the world's first lighthouse, Pharos of Alexandria, one of the Seven Wonders of the World and the archetype of all future lighthouses. The Chinese are perhaps the first to use optical lenses and the first documented case of a corrective lens occurs around 100AD. Documented in the 'Shih Chi' and 'Chhien Han Shu' of the Han period (ch.28, p24) [Trans., Chavannes, vol.3, p470] is the shadow play by the magician called Shao Ong who made the spirit (it would appear) of a dead concubine appear to the Emperor Wu Ti. This sort of shadowful illusion was repeated many times throughout Chinese culture and all of Asia. These puppets were made of paper-thin cutouts and were called Shadowplays, and later known as Shades. Also heaped in Chinese culture are the many instances documented where images of landscapes are seen upon frozen surfaces. Rivers, lakes and basins have numerous times been reported to "hold" the scenes of nature. Shadowplays, or Shades as they were known, came in all shapes and sizes. 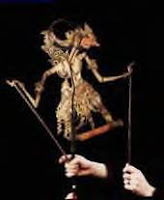 Although shadows were cast upon walls or behind thin screens, some puppets were actually meant for direct viewing, Usually made from dried animal skins or primitive paper and then painted, Shades were found in many cultures including China, Turkey and Greece. 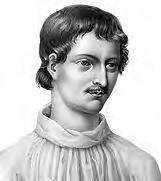 The first Roman shadow plays are written by poet and naturalist Lucretius around 65 BC. Chinese scientist Ting Huan discovered the apparent movement seen through convection currents of hot air generated by a lamp around 180 AD, and Greek physicist Galen begins studying binocular vision during the same period. 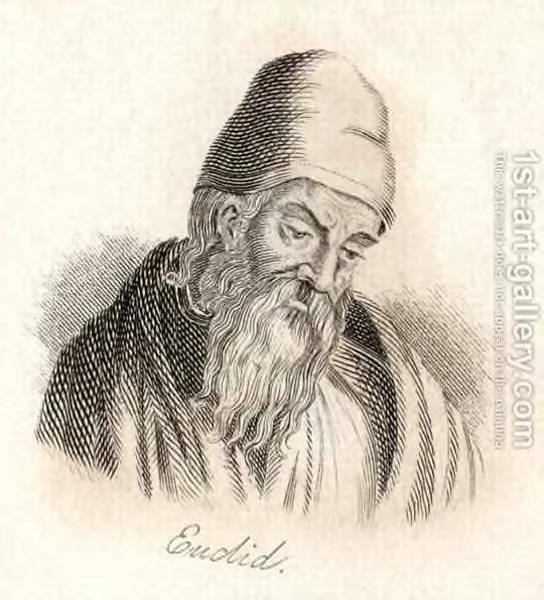 In 525 AD, Roman scholar and mathematician Anicus Boethius attempts to document the speed of light, but is decapitated for his efforts after being accused of treason and magic. Arabian alchemist Gerber observed the darkening effect of bright light on silver nitrate around 750 AD. During the next two hundred years, both Arab and Chinese scientists observe eclipses using the camera obscura effect. In the 10th century, Yu Chao Lung built miniature pagodas designed to observe pinhole images projected onto a screen, demonstrating the divergence of light rays after passing through the pinhole. During the early years of the second millennium, Arabic science proliferated, especially with regards to research in astronomy, optics, and vision. The Chinese investigations of optics also flourished for a time as they experimented with lenses, mirrors, and shadows, but stagnated after the 1200s. In medieval Europe, scholars strictly adhered to the teachings of the ancient Greek philosophers, particularly Aristotle, as well as those of the Church. Science was viewed as a process that required only observation of the natural world interpreted by rational thought and correct theology. Experimentation was not considered essential to understanding how the world works. The Greek notion that the eyes transmit light rays was finally discarded and the eyes were correctly understood to be light receivers. The first truly functional magnifying lenses were produced in the 1200s, and by the 1400s lenses were being used to make reading glasses. The Chinese had developed eyeglasses with colored lenses even earlier, but these apparently were used for ornamental purposes, rather than vision correction. By 1600, high quality lenses were being produced and used to make the first microscopes and telescopes. During the second half of the 1200s, Europe began to emerge from its Dark Age. 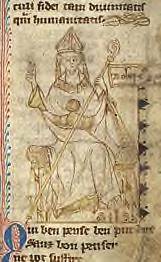 Robert Grosseteste, an English bishop (Bishop of Lincoln) and scholar, introduced Latin translations of Greek and Arabic philosophical and scientific writings to medieval Europe. 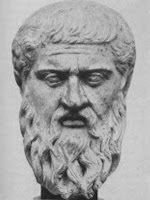 Remarkably, he proposed that a theory could only be validated by testing its predictions with experimentation--a substantial deviation from Aristotelian philosophy and the beginning of scientific method in Europe. 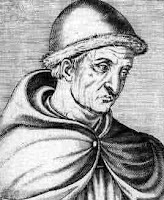 His student, Roger Bacon, continued his advocacy of experimentation and tried, unsuccessfully, to get the Church to incorporate experimental methods into its educational system. Other notable contributions to Optical Study were Bernard of Gordon, a French physician, who in the 1300's wrote in a volume of his medical series Lilium Medicinae about the use of spectacles as a means of correcting far-sightedness--the first written record of lenses being used to correct vision. 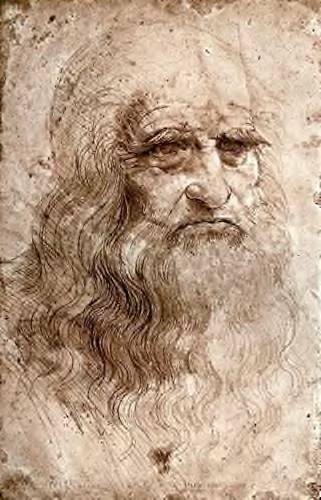 In 1480, Leonardo da Vinci of Italy, studied the reflection of light and compared it to the reflection of sound waves. Tragically, in 1584 Giordano Bruno, ( right) an Italian philosopher and scholar, writes On the Infinite Universe and Worlds, rejecting the Aristotelian view of an Earth-centered universe and theorizing that the universe is infinite with an infinite number of worlds. He is burned at the stake in 1600 for refusing to recant his views. The seventeenth century brought astronomical changes to the world of science and optics, literally and figuratively. The invention of the telescope and microscope in the 1590s triggered enormous interest in exploring previously unobservable realms. The observations made from those explorations would transform human understanding of the world and the universe. Throughout the previous centuries, the Church had been intricately involved with scientific studies, but towards the end of this century, scientists began to separate themselves from the Church hierarchy. Scientists developed their own organizations to discuss and evaluate their work and the sciences began to function as organized disciplines. The foundations of physics, chemistry, and biology were established and, most importantly, scientists were finally able to conduct their studies unimpeded by church or state. In 1704, Newton published Opticks, a consolidation of his writings and experiments on light, color, and optics and an exposition on his corpuscular theory of light. A masterpiece of experimental physics, this book not only elaborated on his previous work in optics, but showed how to use experiments to explore a subject. He explained how hypotheses could be used to prompt more experiments until enough information had been gathered to formally propose a theory. Opticks would serve as a model for the investigation of heat, light, electricity, magnetism, and chemistry well into the 1800s. An auspicious discovery in this century was the relationship between lightning and electricity, as demonstrated by Benjamin Franklin's famous kite-flying experiment in 1752. This and other experiments convinced Franklin that all materials possessed some kind of electrical "fluid." In England, William Watson independently came to the same conclusion. Studies like these set the stage for nineteenth century investigations into the nature of light, electricity, and magnetism and the discovery that light is an electromagnetic phenomenon. James Clerk Maxwell was one of the greatest scientists of the nineteenth century. He is best known for the formulation of the theory of electromagnetism and in making the connection between light and electromagnetic waves.Much of modern technology has been developed from the basic principles of electromagnetism formulated by Maxwell. The field of electronics, including the telephone, radio, television, and radar, stem from his discoveries and formulations. 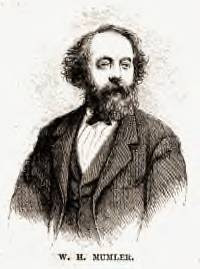 While Maxwell relied heavily on previous discoveries about electricity and magnetism, he also made a significant leap in unifying the theories of magnetism, electricity, and light. His revolutionary work lead to the development of quantum physics in the early 1900's and to Einstein's theory of relativity. Photography as a medium grew out of scientific experimentation in optics and chemistry. The earliest photographic images were made by placing objects (such as plants or fossils) onto light sensitive paper and then exposing the paper to the sun. William Henry Fox Talbot produced the first examples of these, and later Louis J.M. 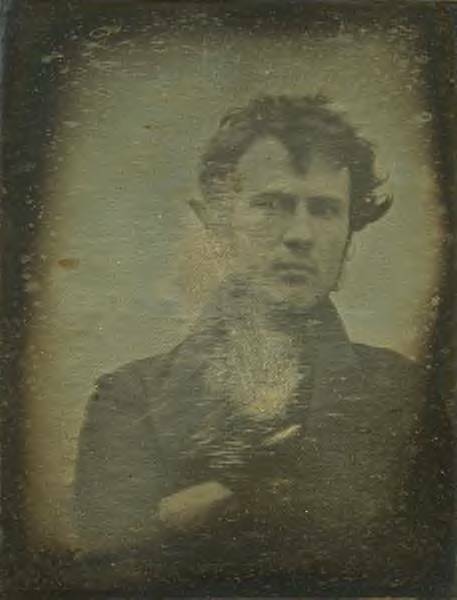 Daguerre experimented with similar images before going on to develop the "daguerreotype," the forerunner of the modern photograph. 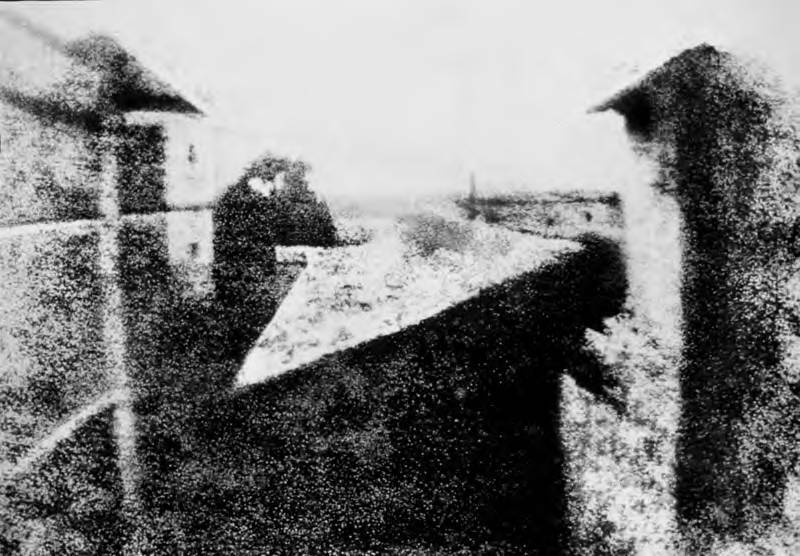 The first permanent photograph above, (later accidentally destroyed) was an image produced in 1826 by the French inventor Joseph Nicéphore Niépce. His photographs were produced on a polished pewter plate covered with a petroleum derivative called bitumen of Judea. Bitumen hardens with exposure to light. The unhardened material may then be washed away and the metal plate polished, rendering a negative image which then may be coated with ink and impressed upon paper, producing a print. Niépce then began experimenting with silver compounds based on a Johann Heinrich Schultz discovery in 1724 that a silver and chalk mixture darkens when exposed to light. In partnership, Niépce (in Chalon-sur-Saône) and Louis Daguerre (in Paris) refined the existing silver process. 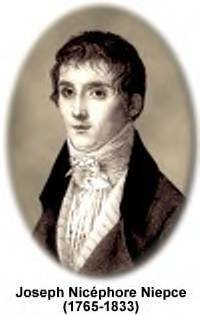 In 1833 Niépce died of a stroke, leaving his notes to Daguerre. 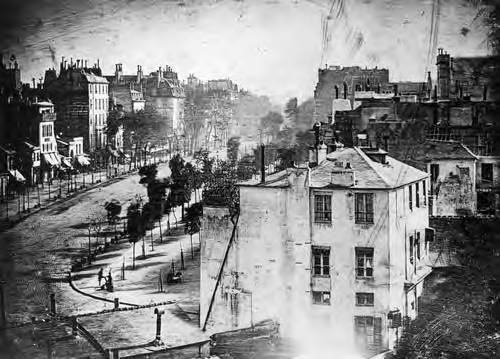 "Boulevard du Temple", taken by Louis Daguerre in late 1838 or early 1839, was the first-ever photograph of a person. It is an image of a busy street, but because exposure time was over ten minutes, the city traffic was moving too much to appear. The exception is a man in the bottom left corner, who stood still getting his boots polished long enough to show up in the picture. Because of the nature of early photography — passive camera operators, long exposure times — it was widely felt that a photographic image was a completely objective record, untainted by human bias. 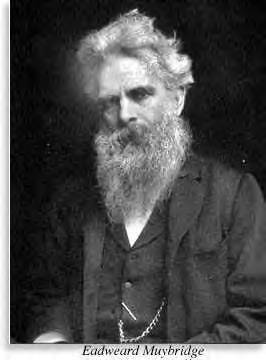 Additionally, Eadweard Muybridge's famous photographic series of a galloping horse demonstrated that the flat, uninvolved gaze of the camera could capture things the human eye could not see; in the case of the horse, this proved to be the fact that all four of the horse's hooves were off the ground simultaneously at some point during the gallop. These two aspects of the new technology — both its supposed scientific inviolability and its ability to freeze images invisible to the human eye — contributed to its use in the sciences as well as among adherents of the new religion of Spiritualism. Photography was truly born in 1839, but the life of spirit photography occurred between 1860 and 1930. Spirit Photography refers to the use of photographic technology to document the supposed existence of ghosts and spirits. The American Spiritualist Movement, known commonly as spiritualism, swept across America in the 1850s. It was triggered by the claims of the Fox sisters in Hydesdale, New York, that they could communicate with the dead. From this one startling anecdote developed a full-fledged movement of belief. Pioneers in photography took the opportunity to use the public's fascination to their advantage. In many cases, photographers attempted to conjure up images of deceased relatives in an attempt to communicate with the dead. William H Mumler is credited as being the first photographer to claim to capture an image with the company of a ghost or spirit. He worked in America in the 1860s. When he first began taking photography classes, he came upon a faint image of a young girl in one of his portraits when he was dealing with the sensitive wet plate. 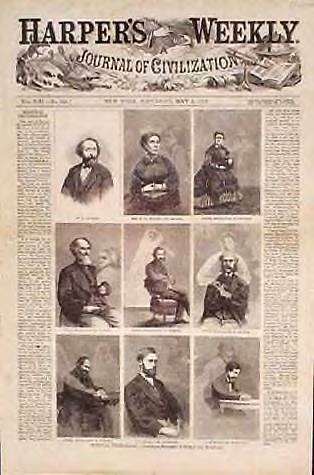 He assumed it was due to his inexperience, but when he jokingly showed the photograph to a spiritualist friend, it was blown out of proportion and even ended up on two newspapers as evidence of the existence of spirits. 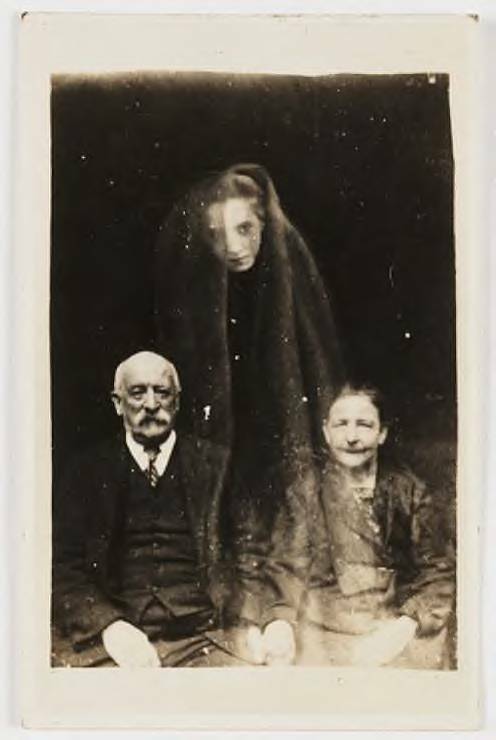 Realizing the demand for spirit photographs of dead relatives, Mumler began taking on well-to-do clients for sessions in which he would try to conjure up spirits. Mumler's career began to be questioned when several faithful followers realized that the spirits that appeared in their photographs were actually portraits of other living people, some who had just recently been photographed before. 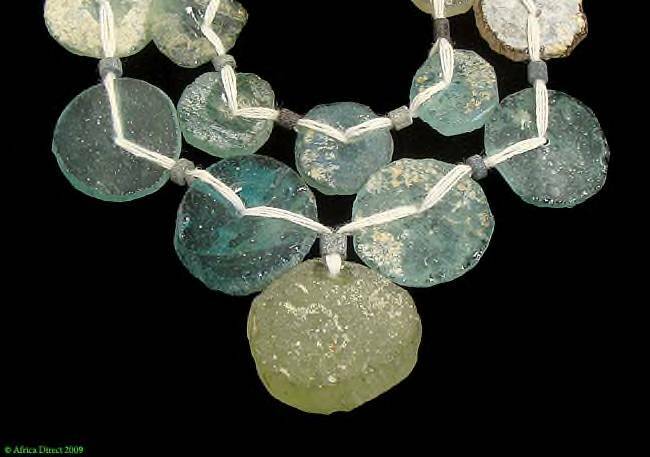 Mumler was forced to retire to his previous job as a jewelry engraver, but he moved his family to New York to try to start anew. Not long after, a major court case ensued that shook the roots of spirituality itself. Chief Marshall Joseph H. Tooker went to Mumler's shop incognito and gathered evidence that he might be falsely producing spirit images. There was a preliminary hearing as to whether Mumler should go before a grand jury in New York, but this hearing was treated as a full-scale trial, with the notable Elbridge T. Gerry arguing for the prosecution. Although in the end Mumler was acquitted, the presiding judge was still convinced he had been pulling some sort of trick that the prosecution failed to prove. Nonetheless, the trail served as one of the most poignant debates about spiritualism and spirit photography. By the end of the trial and after a massive outpouring of debate from both sides into newspapers and journals, the Photography Section of the American Institute resolutely concluded that spirit photography was a "trickery" and the public eventually came to adopt this viewpoint. In America, the casualties of the Civil War rendered the American public willing to believe that they could somehow connect with those they lost. Globally, spirit photography saw a resurgence following World War I when people would do anything to communicate with their dead relatives. Since many believed that seances conjured up the presence of spirits and not necessarily their visual existence, this type of photography was mainly used just to record the reactions of those present. Another type was the documentation of activities of movement. This includes levitation and any other kinds of movement that could be recorded with a camera. The last major type is that of ectoplasms. Ectoplasms were the most horrifying and outlandish type of spirit photography and are shocking even by today's standards. They usually include a woman medium who is forced into varying degrees of displeasure by an internal disturbance. She is often photographed vomiting, lactating, or otherwise excreting a mesh-like substance that is believed to be an unhealthy force. 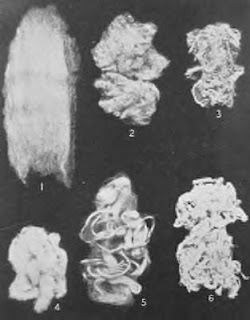 Although the photographs make the expelled material look real, there was no physical evidence of it. In fact, ectoplasms were so fascinating simply because they vividly documented something too fleeting or invisible for the human eye to see. American company Kodak presented its first camera, which held a twenty-foot roll of paper, in 1888. It improved upon the camera by making a transition from paper to film. It continued with the marketing of developments that included the first thirty-five-millimeter SLR camera named Exacta. Another development was the Kodachrome, the first color film that utilized a subtractive method to generate an image. Professional photographers and movie makers liked Kodachrome for its high quality color images. Kodachrome was eventually discontinued because the public preferred digital technology. 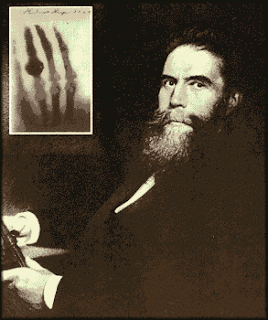 Within a year of German scientist Wilhelm Roentgen's discovery of x-rays in 1895, people throughout the world knew about Roentgen's work and had seen his first x-ray picture — his wife Bertha's hand, showing her bones, wedding ring, and all. Even before Roentgen was awarded the first Nobel Prize in physics in 1901 for his discovery, x-ray studios were popping up that sold bone portraits for display in the home. As their popularity grew, some publications contained inflated claims about x-rays — they could restore vision to the blind, they could raise the dead. From the first X-rays, scientists began using photography for more objectively measurable purposes. It could be argued that after so much public debate about the different famous spirit photographers, the public was ready to engage in advancements that could actually be documented. Experimental research about the human body became a viable way to make measurable progress. Even though the casualties of war tempted many to want to believe in the ability to communicate with spirits, people eventually understood that the best use of resources was to apply it to something much less controversial and linear. Just as spirit photography sought to photograph parts of the body unseen by the naked eye, many technologies that developed later extended this idea. Modern day ultrasounds, MRIs, and X-rays all date back to spirit photographs. Photography has a rich history that progressed through the Industrial Revolution. People developed methods to simplify the use of the camera with digital technology, which made it a household item. The transition to digital began with important advancements in technology during the 1960s. For instance, the space program National Aeronautics and Space Administration, NASA, used analog, photography that utilizes chemical film technology. They made the switch to digital images to show images of the moon's surface. Space probes, computerized spacecrafts, were programmed with digital technology. NASA sending digital images of the moon marked a large scale acceptance that digital images were convenient and reliable. The fascination with spirit photography is still present today. However, most Image-makers in the 21st century, cannot present their photos without encountering a debate about image manipulation. Computer Imaging software such as Photoshop have contributed to the controversy, making it very hard for researchers who attempt to prove the validity of possible spirit photos, to present evidence. Even if the spirits of the dead are capable of being photographed, current technology makes it easy to recreate ghostly images, therefore making all spirit photography presented, to be called into question as having been tampered with or manipulated. 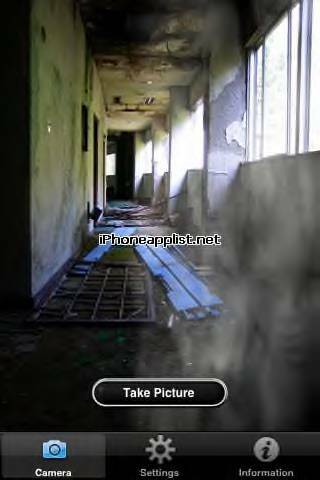 Recent additions of Iphone photo applications for manipulating spirit photos, only adds to the skepticism. Firenze, Paul. "Spirit Photography: How Early Spiritualists Tried to Save Religion by Using Science." Skeptic. Vol 11 No 2. 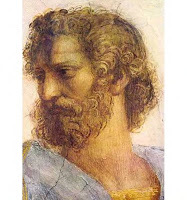 2004: 70-78.
http://museumvictoria.com.au/scidiscovery/image_pages/mn001436.asp?url=/scidiscovery/scientists/aristotle.asp Aristotle. detail from the "School of Athens" by Raphael.